The general area around Drumheller boasts the strikingly beautiful badlands, Dinosaur Provincial Park, and so much more! It's commonly accepted as the dinosaur capital of Canada. Nearby Drumheller is the World's Largest Dinosaur - a 27 metres (90 ft) high Tyrannosaurus Rex. Drumheller also boasts the Royal Tyrrell Museum of Palaeontology, a world-renowned museum that hosts the world's largest collection of dinosaur fossils under one roof. It attracts 350,000 visitors a year, the largest of all provincial museum attractions. RealPlayer is required to listen to audio files. Download the RealPlayer plug-in for your browser. The Dinosaur Park at Drumheller, Alberta. Walking around this eerie landscape, and seeing the bones of animals which lived so long ago still present in the ground as you walk by is a life-changing experience! It gives you a whole new insight on life today as we know it, and a completely different perspective on your place in the world, and all it's problems. A Canadian Wonder for sure! I would like to nominate the Drumheller Valley as a Canadian Wonder. Located in Alberta, the wide expanses of green and gold prairie land suddenly opens into a chasm that once was ancient glacier-produced river. The length of the valley is lined in beige, white and brown strata and overhead is blue sky and bright sun. The modern world is miles away. This is something all Canadians should walk or cycle through to get a whiff of natural history in its prime. There is nowhere else where you can feel a time warp of 70 million years just by walking around! The Drumheller Valley is a place that cannot be forgotten once visited! It is truly a wonder to behold! Drumheller! It is so unexpected, so completely different from what surrounds it, so fascinating and the museum complements it perfectly. I'd like to nominate the Hoodoos in between Drumheller and East Coulee in Alberta. Apart form being a really beautiful natural phenomenon, it's close to my heart for different reasons. I can see the site from my mother's house and can walk up to it when I visit. When the tourists have left the site for the day, it's beautiful, peaceful and regularly catches the sunset in a breathtaking way. 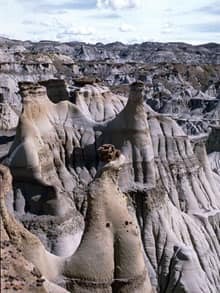 Maybe if this site (or the many hoodoos around the valley) get onto your list, we can have protective measures put in place to stop the erosion they are put through when people climb on them. I live in England at the moment and the measures their National Trust have put in place on ancient sites have helped immensely. Maybe, then, we can have sites that have thousands of years of history as well! I think a shoo-in for Canada's Seven Wonders has to be the Badlands in southern Alberta. Of course the area is hugely important as the site of millions of fossils and dinosaur bones, not to mention being the location of the world famous Tyrell Museum. But the Badlands should be on the list anyway, for sheer breathtaking majesty. You drive along a dry prairie road, and as far as the eye can see, the land is flat flat flat flat flat. Then virtually in an instant, a vast chasm opens up before you, and a wonderful, endless labyrinth of desert rock spreads to the distant horizon. It's a stunning revelation. And once you're down inside it, millenia of geological history and erosion patterns are displayed before you in dazzling rock patterns, while the weirdly shaped hoodoos stand guard. This spectacular site really should be on the list. My nomination for one of the seven wonders of Canada is the Alberta badlands. One drives through miles of wheat fields, and then the road drops into the amazing lanscape of the badlands. The wheat fields give way to dry coulee's covered with sagebrush and cactus. Walking through this magical place one is quickly taken back ninety million years. Bones of dinosaurs litter the gullies. Tyrannosaurus teeth poke through the betanite clay, still shinning after millions of years. Antelope and deer graze in the valley bottoms along the creeks. Rattlesnakes sun themselves on the dry slopes. Dinosaur Provincial Park is a World Heritage site, and the Tyrell Museum Of Palentology is one of the finest in the world. This treasure has given Canada so much wealth in terms of the past, and so much beauty in the present. It is truly one of the wonders of Canada.